(U//FOUO) In September 2014, The Islamic State of Iraq and Syria (ISIS) released a propaganda video encouraging its followers to murder “intelligence officers, police officers, soldiers and civilians.” The video was re-released in January 2015 and specifically named the United States, France, Australia and Canada as targets. 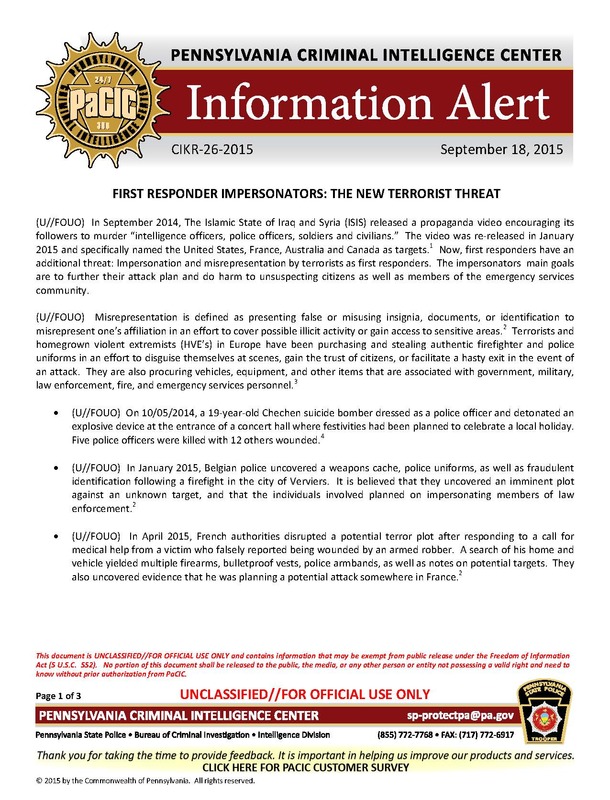 Now, first responders have an additional threat: Impersonation and misrepresentation by terrorists as first responders. The impersonators main goals are to further their attack plan and do harm to unsuspecting citizens as well as members of the emergency services community. (U//FOUO) Misrepresentation is defined as presenting false or misusing insignia, documents, or identification to misrepresent one’s affiliation in an effort to cover possible illicit activity or gain access to sensitive areas.2 Terrorists and homegrown violent extremists (HVE’s) in Europe have been purchasing and stealing authentic firefighter and police uniforms in an effort to disguise themselves at scenes, gain the trust of citizens, or facilitate a hasty exit in the event of an attack. They are also procuring vehicles, equipment, and other items that are associated with government, military, law enforcement, fire, and emergency services personnel. • (U//FOUO) On 10/05/2014, a 19-year-old Chechen suicide bomber dressed as a police officer and detonated an explosive device at the entrance of a concert hall where festivities had been planned to celebrate a local holiday. Five police officers were killed with 12 others wounded. • (U//FOUO) In January 2015, Belgian police uncovered a weapons cache, police uniforms, as well as fraudulent identification following a firefight in the city of Verviers. It is believed that they uncovered an imminent plot against an unknown target, and that the individuals involved planned on impersonating members of law enforcement. • (U//FOUO) In April 2015, French authorities disrupted a potential terror plot after responding to a call for medical help from a victim who falsely reported being wounded by an armed robber. A search of his home and vehicle yielded multiple firearms, bulletproof vests, police armbands, as well as notes on potential targets. They also uncovered evidence that he was planning a potential attack somewhere in France. (U//FOUO) Terrorists have the potential of using these same tactics in the United States, as there are numerous businesses that cater to the needs of first responder personnel. A wide variety of products such as clothing, weapons, and tactical gear can be purchased on the Internet by any consumer, regardless of a confirmed affiliation to emergency services, government, or law enforcement agency. • (U//FOUO) In November 2014, a Fairfax County (VA) police officer observed a male wearing a Prince George’s County Fire/EMS Department turnout coat. The subject advised the officer that he had previously been employed by that department in Maryland as a firefighter, but resigned due to an injury. Upon further investigation, it was discovered that the subject had never been employed by Prince George’s County, neither as a paid nor as a volunteer firefighter. Additionally, his girlfriend reported that he had purchased the coat for $200 from an unidentified firefighter. • (U//FOUO) In March 2015, a member of the Illinois National Guard allegedly offered his uniform to his cousin to allow him to enter an armory and conduct an attack.